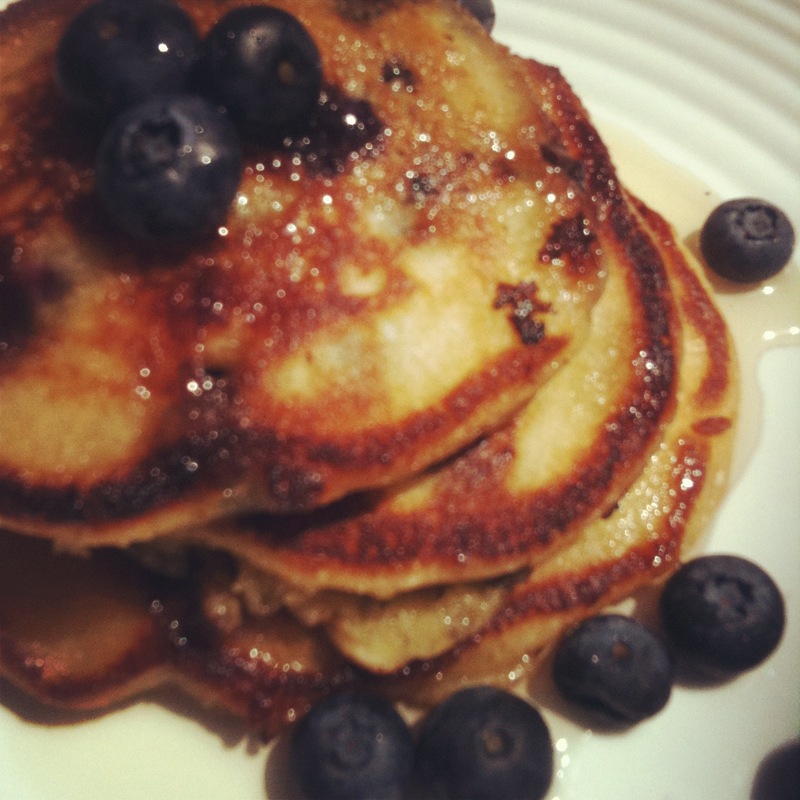 I made these pancakes from The Joy of Cooking for the first time in university for a guy that I was dating and, even after we broke up, he still raved about the fluffy flapjacks. This morning I woke up craving something different than our usual weekend breakfast of scrambled eggs and toast, so I thought I’d introduce Dave to the joy of these homemade hotcakes. I spared some not-so-fresh blueberries a green bin fate and threw them into the batter for some added deliciousness. The pancakes were a perfect way to ease into a holiday Monday and I’m happy to say that they had a similar effect on Dave as they did on that long-ago boyfriend. The recipe is so ridiculously easy that it makes me wonder why I’ve been using the Aunt Jemima stuff all these years. Mix the liquid ingredients quickly into the dry ingredients. Cook in frying pan or griddle, using 1/4 cup of batter for each pancake. This entry was posted in Food and tagged 2 eggs, blueberry pancakes, blueberry pancakes recipe, breakfast, brunch, cooking, eating, flapjacks, food, green bin, homemade pancakes, hotcakes, how to make homemade pancakes, how to make pancakes from scratch, joy of cooking, pancake recipe, pancakes, pancakes recipe, purpose flour, scrambled eggs and toast, teaspoon salt, the joy of cooking, the joy of cooking pancakes, the joy of cooking pancakes recipe, weekend breakfast by lovewritenow. Bookmark the permalink.